Many people will tell you that you can gain a better job, higher salary, better lifestyle, and a happier outlook when you seek higher education. However, people often overlook the huge amounts of debt you’ll likely accrue while striving to obtain an education. With education costs on the rise, it is a miracle if you can graduate from college without any student loans. In fact, Americans now owe more than $1.3 trillion in student loan debt. On average, more than 1 in 4 American adults have student loan debt. And, while the standard repayment timetable for federal loans is 10 years, most people take an average of 19.7 years to pay off their loans. That’s a long time to be in debt! 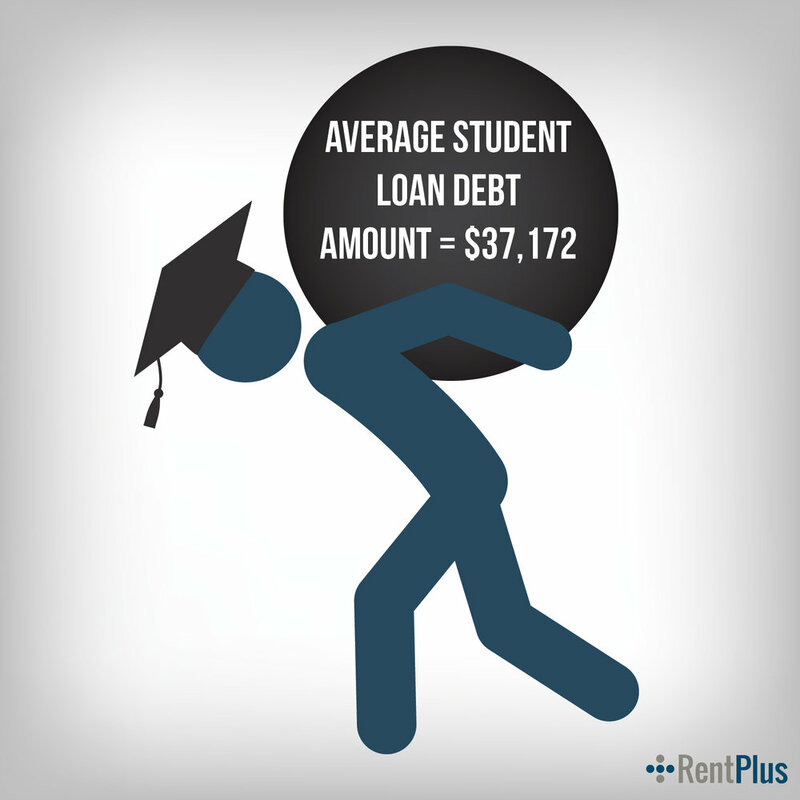 The average student loan debt amount is $37,172. Student loan debt has recently surpassed credit card debt and auto loan debt. In fact, the average cost of one year at a public university today is $20,770. That is roughly 35.2% of the median household income of $59,039. These numbers haven’t even touched on what it costs to obtain a graduate degree after you’ve already accrued $37,172 for your undergraduate degree. 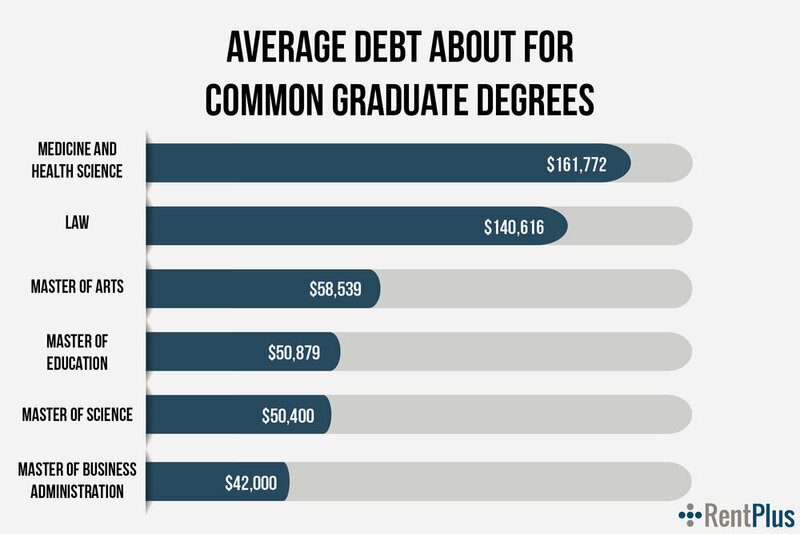 The picture below depicts how much money it will cost you on average for the six most common graduate degrees. Yes, you’ll be making a huge amount of money, but you’ll also be tens to hundreds of thousands of dollars in debt after college. How are all of these student loans affecting students? If you’re tens to hundreds of thousands of dollars in debt by the time to finish college, will you ever be able to achieve financial freedom? According to a recent Comet survey, 41% of people with student loans wouldn’t be able to afford a surprise bill of $400. With most of what little income you make going towards school expenses, it can be hard to build an emergency savings plan or put money into retirement. That’s why it’s crucial to start saving and building your retirement fund as soon as you get a job after college. You don’t have to manage your finances alone, however. Use FinStrong to learn more about how to take control of your finances and make a plan to pay off your student loans. And RentPlusMoney is an awesome budgeting tool to help make managing your finances easy, fun, and effective. While higher education costs more than it has in years, more than two-thirds of American high school students choose to go to college. Many statistics show that you really can have a better job, higher credit score, and a better lifestyle with a higher education. Higher education is a good thing. Just be wise with your finances and try to lower the amount of student loan you might accrue while attending college. The more money you can save in college, the better off you’ll be towards achieving financial freedom after graduation.